At the end of May 1998, as I was nearing the end of my second year of teaching, I received a “see me” note from my principal. As I made my way to his office, I wondered what the problem might be. When I arrived, he came right out and asked me the question that all too often is asked of new teachers: “How would you like to take over as our leadership teacher and student council adviser?” I quickly said “Yes!” I had stopped by the previous adviser’s class a couple times and I had attended most of the dances and events. I had experience working with kids even before I began teaching. Plus, I was involved in student council in high school. How hard could it be? When school started that fall, I realized how much I did not know. The dances, rallies, budget meetings, community service projects, and meetings did not happen automatically. The students needed to be trained, and so did I. The previous adviser had gone to teach at the high school, so I was left to figure things out on my own. I was overwhelmed. Fortunately, I found some publications that were left behind from NASSP and NatStuCo. One title was Middle Level Activities to Involve the Invisible Student by Sue Rimmer and Jim Arico. I used this resource a lot my first year. I attended state conventions and met other advisers from around the area and I quickly found out that student council advisers and leadership teachers were the most giving group of people when it came to sharing ideas. I learned a lot during that first year as a middle level adviser. I learned that students needed and deserved an adviser who respected them and their ideas, but one who was also willing to guide them. They needed to be allowed ownership of program, but first they needed to be taught how things were done. One of the most valuable lessons I learned was that “students will support that which they help create.” We need to ask more questions. We need to give our students a chance to share their ideas. You will be surprised at what they come up with. This became abundantly clear during that first year. We had begun planning an event that had been done at our school for years. An eighth-grade student raised her hand and asked frankly, “Why do we do this event?” I realized I did not have an answer. That opened a floodgate of responses from students who proceeded to tell me that nobody really liked the event. After asking several staff members why the event had been done in the past, the only answer I got was, “Because we have always done it.” We decided as a class not to do the event that year. Guess what? The students did not miss it. We replaced it with another event that was well received by the student body and staff alike. Had I not listened to the students, we may have continued to do an event that nobody even wanted to do. We need to continually ask “why” when it comes to events and activities. If we cannot answer that question, then that is probably a telltale sign that we should look for an alternative activity. Another lesson I learned very quickly during that first year was that not all staff members were going to be on board with my plans. As a relatively new, young teacher, I was up for anything. I soon realized that was not true of everyone. I had to learn to communicate with my staff, and much like I did with my students, I had to seek their input. I learned to explain things well in advance and to seek out other staff members’ ideas for improvement after each event. As a result, our events improved and staff members actually began looking forward to being involved. I have heard that the life span of a typical adviser is about five years. I am happy to say that I have survived 20. I never thought that “see me” note I received two decades ago would lead to such promising results and land me what I believe is the best job I could have ever (not) asked for. Bill Battaglia is director of student activities at Bidwell Junior High School in Chico, CA. Feeling overwhelmed? 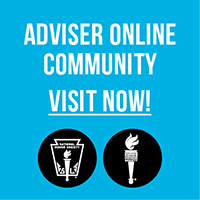 Visit the Adviser Online Community at https://community.nassp.org to get tips and advice from fellow advisers who have been in your shoes!